UPCOMING!! AVIVAR VOICE CHALLENGE 2018 | AUDITIONS! HomeEventsUPCOMING!! AVIVAR VOICE CHALLENGE 2018 | AUDITIONS! Nigeria stand up! Port Harcourt stand up! Do you have that Golden voice you really want to let soar? Looking for the perfect platform to showcase your talent and get you out there? Then be sure you don't miss out on the first ever edition of the AVIVAR VOICE 🎤🎵 CHALLENGE! WINNERS STAND A CHANCE TO WIN: . 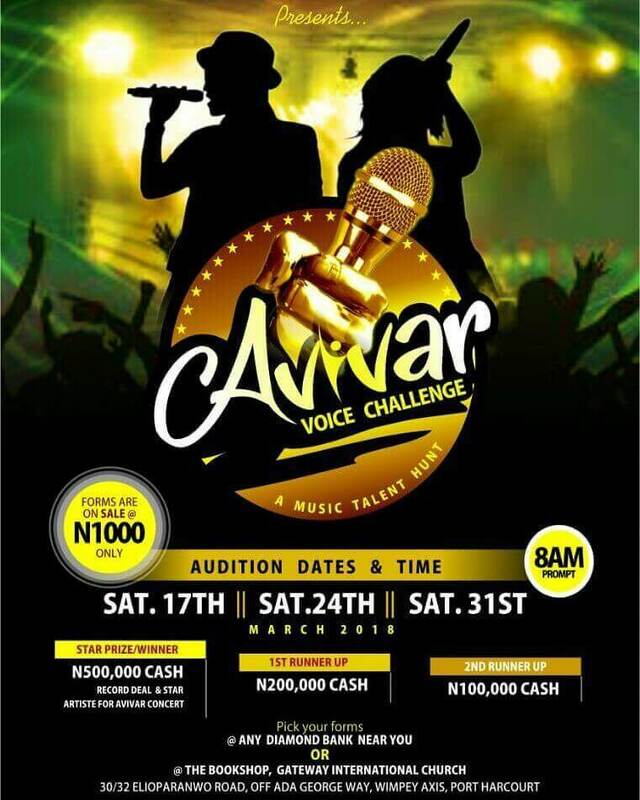 #500, 000 Naira plus a Recording deal and also feature as Star artiste at the forthcoming Avivar concert! . ★ Grab your Forms for just #1,000 (One Thousand Naira) at any Diamond Bank branch in Rivers State or any Gateway Int'l church centre in Rivers State. .
Saturday 17th, 24th and 31st of March, 2018 respectively . .
★ Time: 8 AM . Gateway International Church, 30/32 Elioparanwo Road, Off Ada George way, Wimpey Axis, Port Harcourt.